Comments: These colorful birds use their long, yellow toes and legs to walk across floating and emergent vegetation in their coastal marshland habitat. Their purple color, pale blue frontal shield and yellow-tipped, red bill are distinctive. They feed on grains, seeds, aquatic insects and frogs. Within the Great Plains, there are a few localized areas in the southern part of the region where they occur and they are scarce elsewhere. 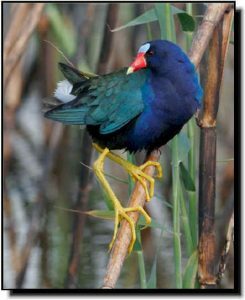 Purple Gallinules occur in small numbers or are found only in localized sites within the Great Plains.